← Annual Forest Tour Saturday, August 3rd. This article originally appeared in the Berlin Daily Sun. It was written by Randolph resident Gail Scott, with whose permission we share it here. When the new Federal Eastern Regional Forester visited the area, “one of her stops was the Randolph Community Forest,” he added. During the Forest Day events, Randolph residents heard a review of the forest’s first ten years and had a chance to make suggestions for the next ten year plan. Forester Walt Wintturi went over each of the goals of the first ten year plan and described how these goals were being met. ▪ education—to educate residents and the public about the natural cycles of forest life and the role that sustainable timber management can play in the forest. Under the income heading, Wintturi said that timber sales from the forest generated enough money to cover forest management costs, which was a requirement of the conservation easement. He said five sale harvesting areas had been identified and “we conducted four timber sales over the past ten years.” The sales generated a total of $493,789 over the ten years or a little less than $50,000 a year. The earnings were mostly swallowed up by maintenance costs, including woods road repairs after heavy rain falls or spring runoff; replacing water bars in steep areas; improving wildlife habitat such as creating wild life openings with a goal of having two to three percent of the forest in openings; marking the boundaries of the forest, and maintaining the transects (passages through the forest where researchers can note plant and animal life); and consulting fees. However, some of the earnings are being paid to the town, Scarinza said. Of the timber harvested, the logger pays a 10 percent timber tax and the forest has contributed about $45,000 to the town over the ten year period, he said. Wintturi noted that the forest is certified as a tree farm, which means that it is being sustainably managed and managed to protect the wildlife habitat and resources. On the question of aesthetics, Wintturi said he is aware of the visual impact of logging. “This is a thought foremost on my mind when I am planning, designing, and laying out a timber sale,” he said. “I know how important the appearance of the forest is to the citizens of Randolph and the people who travel the highways in the area.” He said he tries to make the cuts large enough so that full sunlight will fall to the forest floor to regenerate the trees on that site and create greater biodiversity within the forest. Under recreation, Wintturi said that there is a group in Randolph that has identified some backcountry ski trails on the forest land in some of the higher elevation areas. 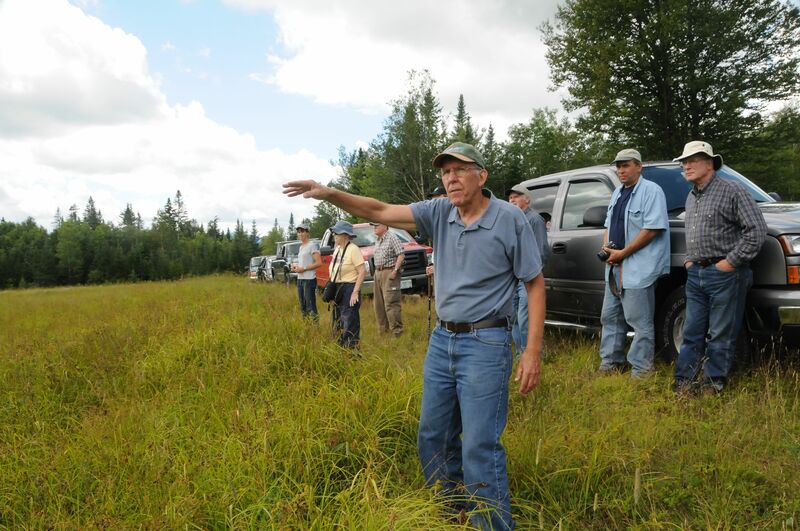 In other instances, he said he has helped lay out snowmobile relocations to prevent erosion.”If you are here on a winter weekend, the forest is buzzing with activity,” he said. ‘Another major goal for the last stewardship plan was to maintain diversity of wildlife habitats and different kinds of plant species in the forest, ” said Wintturi. “That will continue to be a goal.” He noted in particular the openings that are kept mowed to appeal to all kinds of wildlife and the encouragement of alder regeneration because the alder seeds are important for many species. Buffers are maintained along streams to protect trout and the locations of vernal pools are protected as well. Beaver are left alone to do their part to maintain wildlife diversity. Once again, the Community Forest experts noted that there are 15 permanent transects in the forest where researchers can thread their way through the forest, recording plants and wildlife seen. The RCF has created a $5,000 grants program “so if a student working on a Masters wanted to use the transects, they could apply to the Commission to help with some of the expense—this for projects for the good of the forest,” said Scarinza. The Randolph Community Forest has 26 miles of woods roads. “They are a great asset,” Wintturi said. “However, there is a liability: the upkeep. There are 200 culverts; 150 to 200 water bars, and bridges.” A parking lot is maintained at the end of the Pond of Safety Road, a turnaround at the Pond of Safety, and another parking lot is in the works at the head of Randolph Hill Road where there is a trailhead for a number of Crescent Range trails. These projects are a cooperative endeavor with the Forest Service. Under education, Wintturi noted that the RCF organizes an annual forest day tour and now has a website to keep people up-to-date on forest happenings. He also noted that when he is surveying the forest in winter, he is constantly looking at tracks.”I haven’t seen a lynx yet, but I keep looking,” he said. Dave and Dodie Willcox’ gift of 79-acres to the Randolph Forest was announced at the meeting. In the discussion that followed, Edith Tucker suggested that the RCF create a sledding hill somewhere for local children to enjoy in the winter. She also suggested that the RCF sponsor a “Bio Blitz,” a weekend for volunteers to count species in the forest. A resident asked if Wintturi had given thought to the increased vulnerability of the forest due to global warming. Wintturi responded that he has, but regarded that as beyond the scope of the ten year plan now in the works. “I personally notice trends,” he said. “I ask forest researchers within the White Mountains if they are noticing anything. So far, they are not seeing vegetation changes. I expect that what is here now will continue to be for the foreseeable future: balsam fir, sugar maples, birches. We may see more red oak moving in and warmer winters and falls have played a role in the ecology of the moose. Winter tick have increased. But my job is to regenerate trees,” he said. Bruce Cairns noted that a number of the roads formerly used by hunters have been closed. The response was that this is done where there has been serious erosion. He also asked about ATV traffic. Wintturi said that since the ATV trails from Gorham north have opened, there has been less ATV traffic in the forest. “I don’t think there is pent up demand,” he said. Scarinza noted that there has been no ATV problem and “with good luck” it will stay that way. “If it does change, we will have to come up with a plan,” he said. “ATVs are where snowmobiles were 20 to 30 years ago. As they become more structured, there will be more self policing.” Tucker remarked that she thinks “the push will be to open the Jefferson Notch Road to ATV use to connect to Bretton Woods. The Notch Road would bring people to the Presidential Rail Trail and that within the next year will be high on the list of things. People in Randolph and Jefferson will have to think whether or not they want to be part of the circuit. There is an established tourist community and recreational use hotels, motels, and cabins in Twin Mountain and Bretton Woods and they don’t want to be left out. Just as Gorham was reluctant until the Governor (of NH) went to Stewartstown. Then they felt the train was leaving the station. Tourist oriented communities want to be part of the economic push,” she said. Wintturi and Scarinza urged the audience to make suggestions for what they hope to see in the next ten year plan. They noted that there is a place to comment on the plan on the Randolph Forest Commission web site: randolphforest.org.